I have to admit that I completed this workout after a long day of dealing with people who didn’t want to do their job correctly (not at my office, but instead contractors recommended by our insurance company to perform repairs on our house). If you know me, you know that I work at least sixty hours a week between two jobs, so I have a hard time dealing with lazy people. My blood pressure and adrenaline were already high when I started scrolling through my options. I chose “Army”. 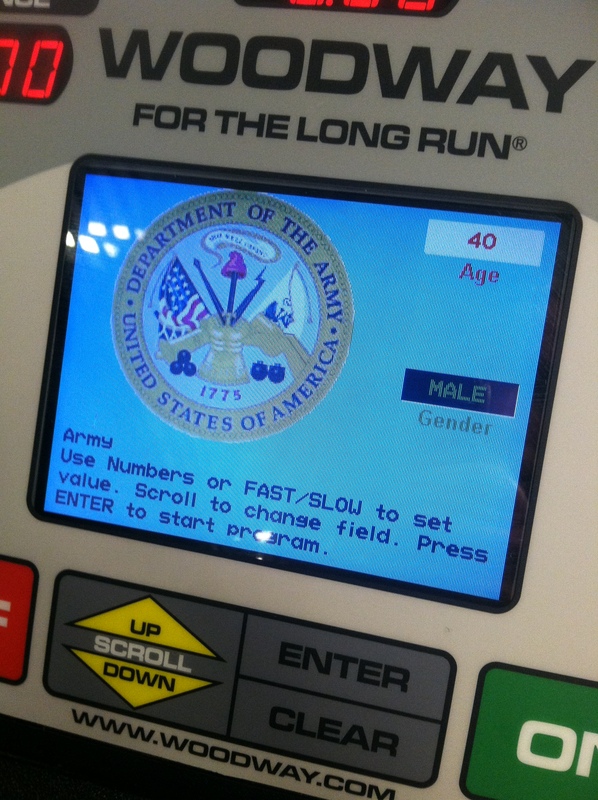 Upon selecting the “Army” Fitness test, I was brought to a screen in which I was asked to enter my gender and age. Ultimately, this would allow the program to tell me how many points that I would get based on my performance. Points range from 0 to 100, with a minimum score of 60 to pass the event. 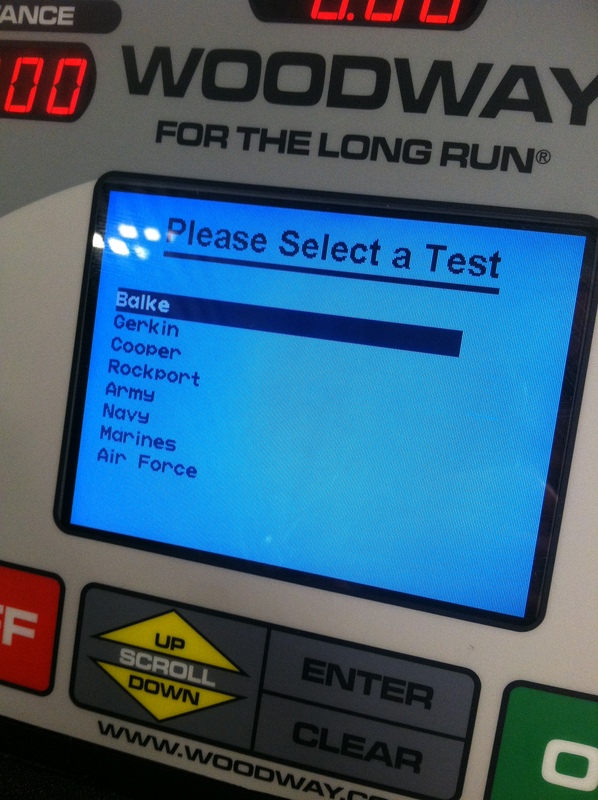 Unfamiliar with what the “Army Fit Test” was, I was surprised when the next screen told me what I would be doing. Run two miles as fast you can with elevation at 0%. Hell yes. Shut my brain off and go. I pushed the speed button up until I was running at solid 8.5 miles per hour (7:00/mile pace). 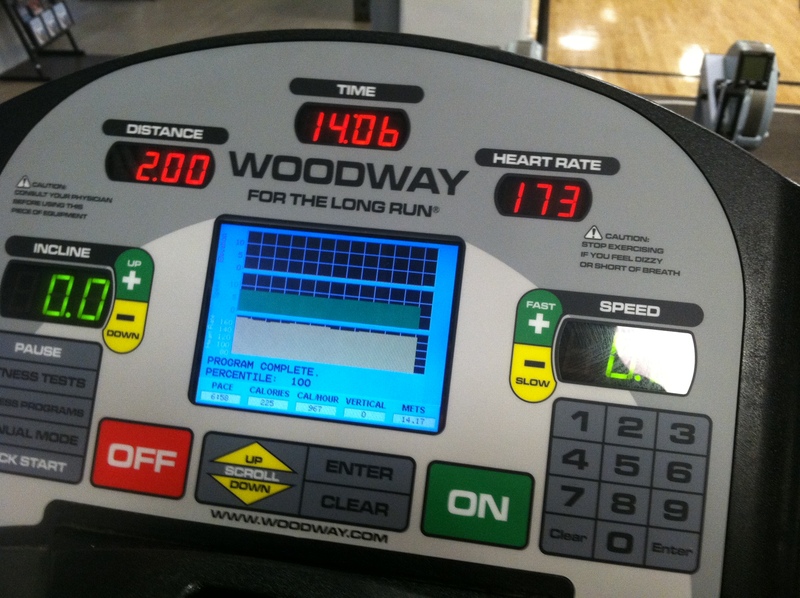 I had no idea how to pace a two mile as fast as I could go run on a treadmill. First, I have never run 2 miles as hard as I can go in my entire life, and second, I was running by myself, so I didn’t have anyone to push me. Surprisingly, my speed didn’t change much. In fact, if I had been running with someone else, I have a feeling I would have run faster. Must be that Type-A personality. Nevertheless, I didn’t settle for anything fewer than 100 points (approximately 14 minutes). I find it hard to believe that that time would qualify me to earn 100 points, but at least the thought of it helped me release all of my pent up anger towards my lousy contractors. I ran another mile at an 8 minute pace before walking a little bit. I have a feeling that I might be a little sore from carrying a faster speed than usual over a longer distance. 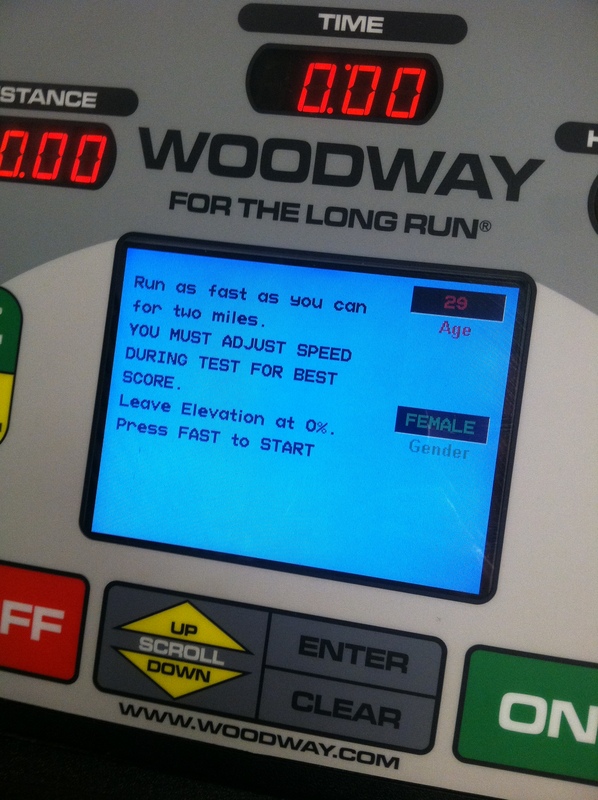 This entry was posted in running, workout and tagged Army Fitness Test, Woodway Treadmill on July 1, 2014 by flyjenduf.